Hearing loss impacts two-thirds of Americans over the age of 70 years. Traditionally ignored as a benign chronic condition, “hearing loss” has begun to cement its status as a public health concern. Recent literature suggests hearing loss is independently linked to important health markers and outcomes, such as cognitive decline, dementia, falls, depression, and increases health resource utilization. Hearing loss may be a modifiable risk factor such that appropriate hearing care could help overcome the mechanistic pathways that relate these outcomes. For example, hearing aid use could help improve the signal presented from the peripheral auditory system to the brain to improve cognitive load or reduce the impact of hearing loss on working memory (i.e. cognitive decline). Although their remains a paucity of methodologically rigorous evidence at this time. In the US, the uptake of hearing aids by persons with hearing loss remains low at less than 20-30%. This statistic, when taken in the context of the strain that many of the comorbidities associated with hearing loss place on the health care system and quality of life, has played a central role in calls to improve access and affordability of hearing care. 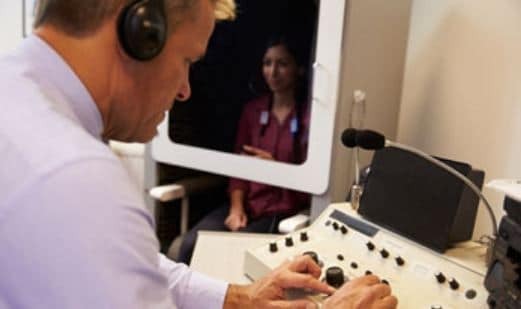 The current model of hearing care, which has remained relatively stagnant for decades and premised on the medical model, diminishes the importance of audiologists’ services from the public view when bundled with the sale of the hearing aid. The recent passage of the Over-The-Counter (OTC) Hearing Aid Act of 2017 enables the Food and Drug Administration (FDA)—by the year 2020—to create the regulatory system for self-fitting hearing aids. These devices are aimed at those with mild to moderate hearing loss that will be available OTC. The law aims to increase accessibility by providing direct access to devices for those unwilling or unable to see an audiologist. Likewise, affordability, technologic innovation, and public awareness of hearing loss may increase as new companies become involved with the hearing aid sector and target the health care consumer. From an audiologic perspective, the authors believe the OTC Hearing Aid Act of 2017 is an opportunity. Decoupling the sale of devices from the audiologist or dispenser will highlight the importance services provided by the professional. Moreover, whereas hearing care was a single point of entry model system, it now becomes a pyramid of multiple care offerings and entry points for the health care consumer. Given that OTC hearing aids address mild to moderate hearing losses, it is plausible that numerous persons will enter hearing care via this new pathway and end up in the audiologists’ services as their hearing loss or perceived handicap from hearing loss progresses. Presently, a great number of diagnostic, treatment, and rehabilitative services are either not currently covered by Medicare or are covered only under specific circumstances. Hearing aids and related services are considered a statutory exclusion. For example, Medicare currently does not cover audiometric testing for the sole purpose of fitting or modifying a hearing aid. Medicare only covers audiologic and vestibular testing that is physician ordered and medically reasonable and necessary, by their definition. As a result, many procedures and services become the financial responsibility of the patient. Treatment and rehabilitation currently have even more limited coverage, especially when provided by an audiologist, even when the audiologist is the most trained and appropriate provider to provide the services. Unfortunately, there is currently no code or mechanism to capture third-party coverage for most audiologic treatment. The codes 92626 and 92627 (evaluation or aural rehabilitation status) are only appropriate, for third-party coverage, for pre- and post-operative services in and around an auditory prosthetic device, such as a cochlear implant. Also, the code 92626 requires at least 31 minutes of patient engagement. These codes currently lack legitimate coverage related solely to a hearing aid or assistive listening device. The codes an audiologist can use to represent a communication needs assessment/hearing aid examination and selection are 92590/1 or V5010. Medicare never covers these codes and their associated procedures because of the hearing aid coverage exclusion. These codes typically only yield third-party coverage when payers cover the resulting amplification. Further, the code 92507 (treatment of speech, language, voice, communication, and/or auditory processing disorder; individual) is currently used, by speech language pathologists, to receive coverage for medically necessary aural rehabilitation. Audiologists cannot utilize this code, within the Medicare system and many other payers, to represent the same service and, instead, are relegated to use of the codes 92630 and 92633 (aural rehabilitation, pre- and post-lingual), which carry little to no third-party coverage, regardless of the payer. Lack of coverage of these codes, when the service is provided by an audiologist, is especially problematic because it is often the audiologist who is the most appropriate and best trained provider to treat the communication and listening difficulties surrounding the hearing loss. Instead, these services are not provided or are bundled into the cost of the amplification, making the device more expensive to obtain. Essentially there are no items or services surrounding the evaluation, fitting, or modification of a hearing aid which have consistent third-party coverage. The vast majority of the treatment or rehabilitation of hearing loss and its associated communication difficulties also has limited coverage, except if provided by a physician or speech-language pathologist. This greatly restricts affordable access to valuable audiologic care and limits the impact of over-the-counter hearing aids. Changes to the field of audiology are on the horizon. The overriding goal, of the delivery of all audiologic and vestibular care, is to provide patients with access to patient-centered, evidence-based, diagnostic, treatment, and rehabilitative services. Audiologists can succeed and thrive, both professionally and financially, in this paradigm. Monetization and patient care are not mutually exclusive. In the context of the importance of hearing loss as a public health concern and changes in hearing aid regulations and classifications, a call for Medicare to realign coding coverage and reimbursement for these services should be made. Reed, N. S., Lin, F. R., & Willink, A. (2018). Hearing Care Access? : Focus on Clinical Services, Not Devices. JAMA, 320(16), 1641-1642. Kim Cavitt, AuD, was a clinical audiologist and preceptor at The Ohio State University and Northwestern University for the first ten years of her career. Since 2001, Dr. Cavitt has operated her own Audiology consulting firm, Audiology Resources, Inc. Audiology Resources, Inc. provides comprehensive operational, compliance and reimbursement consulting services to hearing healthcare providers. She is a Past President of the Academy of Doctors of Audiology (ADA).